THE WEEK OF March 9 — 15 marks this year’s annual Ag Safety Week presented by the Canadian Agricultural Safety Association and the Canadian Federation of Agriculture. While official launch activities occur in Alberta this year, plans are underway to promote farm safety in this province. This year’s theme, Let’s talk about it!, will be reflected in a launch workshop which features group consultations on components of Ontario’s FarmSafe Plan. This workshop will enable participating farmers to return home with the first pieces of a complete safety plan. Dean Anderson, Agriculture Programs Lead with the Workplace Safety and Prevention Services (formerly the Farm Safety Association), hopes it helps alleviate some of the intimidation farmers face in undertaking the plan alone. Anderson says part of modern farming is developing written plans and, though the Occupational Health and Safety Act only applies to farms with paid workers in Ontario at this time, these documents do demonstrate due diligence. More importantly, however, they help farmers identify the greatest threats to their own lives. Seventy-five percent of fatalities on the farm are either directly related to the owner or account for the owners themselves. Farm equipment remains the greatest killer. Anderson says farm fatalities today are half of what they were in the 70s on all those old tractors and the injuries have been coming down at the same rate as almost every other industry sector in the province. Unfortunately, the frequency rate among farmers over 70 is also skyrocketing. Anderson says medications are partly to blame, but so is the fact that a 70-year-old cannot comfortably operate a tractor as long as a 40-year-old. He also notes how, where Grandpa may have been the one helping “The Young Lad” shovel out bins in the past (as few left a 12-year-old to do that job alone all day), technology now enables Grandpa to unload bins alone while “The Young Lad” does his homework. Now if the sweep auger jams and he jumps in the bin to investigate, no one is close enough to hear if he calls for help. “It’s amazing how slow a sweep auger is until you’re not looking at it,” Anderson sighs. 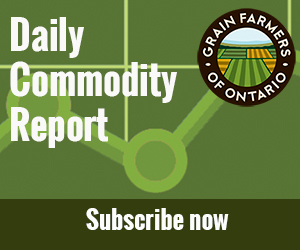 In Ontario, 19 on-farm fatalities were reported in 2013, although it will be a few years before each can be undoubtedly confirmed or others discovered by the Canadian Agricultural Injury Reporting, which relies on slow-moving coroner’s investigations. This number remains in line with the fatality reports of recent years but Ontario still leads all other provinces. A change in tactics is called for. Anderson says the organization will continue to rely as heavily as ever on rural volunteers but is looking for new ways to tie into communities. “In Saskatchewan, ag societies have been doing a number of safety days and I know there’s at least one county in Ontario that is striking a safety committee within the local federation so the old farm safety group that was meeting is going to roll their resources into that committee,” he says. Anderson suspects these solutions could work in the parts of the provinces that do not have strong farm safety groups, especially in the more remote areas of Ontario. There is also the more recent campaign developed by Syngenta to reach the farthest ends of the province, even the country. Kate Mercer, the company’s Digital Marketing expert, launched a small Twitter campaign on September 3 last year entitled #SafeHarvest. She says the company issued 150 safety messages through this 90 day period and received 52 messages from growers, giving a 33% rate of crowd sourced material which demonstrated great engagement. Additionally, Mercer says, social media users considered Syngenta’s safety reminders to be valuable enough to repeat to their own followers 67 times during the harvest campaign. Mercer says safety resonates with farmers across the country and reaching people through Twitter, right in their tractor seat, to initiate these safety conversations is a really unique opportunity for safety promotion. She hopes more farmers will use it to share their own stories of close calls and proactive measures not only to help others prevent dangerous situations on the farm, but also to demonstrate to consumers that the issue is important to farmers.